Our knowledge of many neurodegenerative diseases relies on the possibility of analysing samples only at very late stages of the disease. This drawback increases steadily the faster the progression of the neurodegeneration. Indeed, changes during asymptomatic stages of these diseases cannot be analysed, and, more relevantly, a prodromal study during illness evolution cannot be properly developed, hampering biochemical/molecular studies and drug-discovery. Gerstmann-Sträussler-Scheinker (GSS) syndrome is a rare autosomal dominant neurodegenerative prionopathy characterized clinically by a wide spectrum of manifestations including but not limited to ataxia, spastic paraparesis, extrapyramidal signs and dementia. In some cases patients also showed comorbid Tau hyperphosphorylatioon. Due to the above-mentioned restrictions, we developed an induced pluripotent stem (iPS) cell model using fibroblasts from an GSS patient harbouring the Y218N PRNP mutation and hyperphosphorylated Tau. Y218N iPS-derived cultures showed relevant astrogliosis, increased p-Tau and cell death. α-Synuclein is a key player in the pathogenesis of synucleinopathies, including Parkinson’s disease, dementia with Lewy bodies, and multiple system atrophy. Transmission of synthetic α-synuclein aggregates has been demonstrated in several cellular and animal models. Several groups have reported that insoluble α-synuclein shows prion-like propagation in wild-type mice. However, the basis of the spreading process remains poorly understood although cell to cell transport via exocytosis has been proposed. Because of this, PrPC is proposed as Aβ receptor, and in our current studies we aimed to explore whether PrPC is involved in the propagation and spreading of α-synuclein. We recently developed a new device able to reproduce axon lesioning in vitro in a single chip. Current experiments of our group in collaboration with groups of IBEC and CIBER-BBN aimed at developing new lab on chip devices to mimics and modulate particular neurobiological processes. For example: cortico-spinal chips to develop genetic studies; molecular gradient generation for migrating neurons and in silico 3D modeling for neurodegenerative diseases (Alzheimer and Parkinson chip). Researchers at IBEC, in collaboration with Imperial College London, have discovered that oxidizing species – chemicals such as peroxides that form during the metabolism of oxygen – regulate the regeneration of damaged neurons after spinal cord injuries. Scientists from IBEC’s Molecular and Cellular Neurobiotechnology group have discovered a protein and its receptor that control the spread of adult stem cells in the hippocampus, the part of the brain responsible for memory. From the cells of a patient with a rare neurodegenerative disease, Gerstmann-Sträussler-Scheinker syndrome (GSS), researchers at IBEC have managed to generate neurons that also present parallel neurodegenerative processes unrelated to the syndrome. IBEC researchers have revealed the role played by the cellular prion protein (PrPC) – which is associated with a plethora of biological functions including cell proliferation, differentiation and signaling – in epilepsy. IBEC’s Nanoprobes and nanoswitches and Molecular and Cellular Neurobiotechnology groups are two of the 120 groups featured on the Mapa de la Recerca en Neurociències a Catalunya. Created by the Societat Catalana de Biologia and hosted by IEC, the map aims to be a useful way of depicting the state-of-the-art of research in neuroscience in the region, and also a practical tool for researchers and science communicators. IBEC’s Molecular and Cellular Neurobiotechnology group is to receive funding from 2013’s La Marató de TV3 for their project “Role of the cellular prion protein as “cross-talk” protein between a-syn/ LRRK2 and p-Tau in sporadic and familiar Parkinson´s disease. Researchers at IBEC and the UB have discovered a new factor that participates in the lack of symptoms in the early stages of Alzheimer’s disease – which is one handicap that makes the disease so hard to diagnose. Researchers from IBEC and the University de Barcelona (UB), in collaboration with the Institute of Marseille Luminy, University of the Mediterranean in France and the Cincinnati Children’s Hospital, USA, have identified for the first time a new molecular mechanism regulating the migration of Cajal-Retzius cells in the early stages of development of the cerebral cortex, the outermost layer of the brain. Research done at IBEC that was published in the journal Cell. Mol. Life Sci. last week reveals a hopeful new lead in the quest to understand neurodegenerative diseases such as multiple sclerosis. A project involving IBEC through its affiliation with CIBERNED has been approved by the EU for funding. Much like a kindergarten full of unruly toddlers, the cells that contribute to the body’s crucial processes can’t always be trusted to do what you want or expect them to do. Now IBEC researchers have made an important breakthrough that could contribute to the development of therapies for spinal and neural diseases: they’ve figured out exactly what it is that makes certain cells misbehave in particular circumstances. The Molecular and Cellular Neurotechnology group’s recent paper on the development of epilepsy made the news today in Diario Medico, Spain’s leading newspaper for health professionals. The 12 November press release about the Molecular and Cellular Neurobiotechnology group’s research on inhibitory molecules in neuroregeneration, ‘Beating the regeneration blockers’, was picked up by various online scientific and health news sites including www.sciencedaily.com, the UK’s MS Trust and Cell DNA. Prof. José Antonio del Río, leader of the Molecular and Cellular Neurobiotechnology research line at IBEC, has participated in a study on neural regeneration published in the journal Chemistry and Biology of the Cell group. Reactive oxygen species (ROS) contribute to tissue damage and remodelling mediated by the inflammatory response after injury. Here we show that ROS, which promote axonal dieback and degeneration after injury, are also required for axonal regeneration and functional recovery after spinal injury. We find that ROS production in the injured sciatic nerve and dorsal root ganglia requires CX3CR1-dependent recruitment of inflammatory cells. Next, exosomes containing functional NADPH oxidase 2 complexes are released from macrophages and incorporated into injured axons via endocytosis. Once in axonal endosomes, active NOX2 is retrogradely transported to the cell body through an importin-β1–dynein-dependent mechanism. Endosomal NOX2 oxidizes PTEN, which leads to its inactivation, thus stimulating PI3K–phosporylated (p-)Akt signalling and regenerative outgrowth. Challenging the view that ROS are exclusively involved in nerve degeneration, we propose a previously unrecognized role of ROS in mammalian axonal regeneration through a NOX2–PI3K–p-Akt signalling pathway. Increasing evidence indicates that microRNAs (miRNAs) are contributing factors to neurodegeneration. Alterations in miRNA signatures have been reported in several neurodegenerative dementias, but data in prion diseases are restricted to ex vivo and animal models. The present study identified significant miRNA expression pattern alterations in the frontal cortex and cerebellum of sporadic Creutzfeldt-Jakob disease (sCJD) patients. These changes display a highly regional and disease subtype-dependent regulation that correlates with brain pathology. We demonstrate that selected miRNAs are enriched in sCJD isolated Argonaute(Ago)-binding complexes in disease, indicating their incorporation into RNA-induced silencing complexes, and further suggesting their contribution to disease-associated gene expression changes. Alterations in the miRNA-mRNA regulatory machinery and perturbed levels of miRNA biogenesis key components in sCJD brain samples reported here further implicate miRNAs in sCJD gene expression (de)regulation. We also show that a subset of sCJD-altered miRNAs are commonly changed in Alzheimer’s disease, dementia with Lewy bodies and fatal familial insomnia, suggesting potential common mechanisms underlying these neurodegenerative processes. Additionally, we report no correlation between brain and cerebrospinal fluid (CSF) miRNA-profiles in sCJD, indicating that CSF-miRNA profiles do not faithfully mirror miRNA alterations detected in brain tissue of human prion diseases. Finally, utilizing a sCJD MM1 mouse model, we analyzed the miRNA deregulation patterns observed in sCJD in a temporal manner. While fourteen sCJD-related miRNAs were validated at clinical stages, only two of those were changed at early symptomatic phase, suggesting that the miRNAs altered in sCJD may contribute to later pathogenic processes. Altogether, the present work identifies alterations in the miRNA network, biogenesis and miRNA-mRNA silencing machinery in sCJD, whereby contributions to disease mechanisms deserve further investigation. Aging-related tau astrogliopathy (ARTAG) is defined by the presence of two types of tau-bearing astrocytes: thorn-shaped astrocytes (TSAs) and granular/fuzzy astrocytes in the brain of old-aged individuals. The present study is focused on TSAs in rare forms of ARTAG with no neuronal tau pathology or restricted to entorhinal and transentorhinal cortices, to avoid bias from associated tauopathies. TSAs show 4Rtau phosphorylation at several specific sites and abnormal tau conformation, but they lack ubiquitin and they are not immunostained with tau-C3 antibodies which recognize truncated tau at Asp421. Astrocytes in ARTAG have atrophic processes, reduced glial fibrillary acidic protein (GFAP) and increased superoxide dismutase 2 (SOD2) immunoreactivity. Gel electrophoresis and western blotting of sarkosyl-insoluble fractions reveal a pattern of phospho-tau in ARTAG characterized by two bands of 68 and 64 kDa, and several middle bands between 35 and 50 kDa which differ from what is seen in AD. Phosphoproteomics of dissected vulnerable regions identifies an increase of phosphorylation marks in a large number of proteins in ARTAG compared with controls. GFAP, aquaporin 4, several serine-threonine kinases, microtubule associated proteins and other neuronal proteins are among the differentially phosphorylated proteins in ARTAG thus suggesting a hyper-phosphorylation background that affects several molecules, including many kinases and proteins from several cell compartments and various cell types. Finally, present results show for the first time that tau seeding is produced in neurons of the hippocampal complex, astrocytes, oligodendroglia and along fibers of the corpus callosum, fimbria and fornix following inoculation into the hippocampus of wild type mice of sarkosyl-insoluble fractions enriched in hyper-phosphorylated tau from selected ARTAG cases. 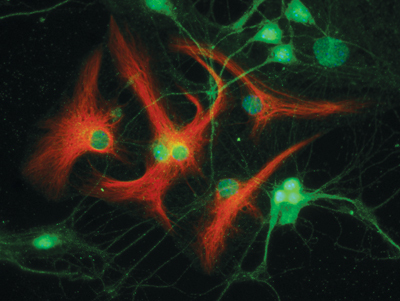 These findings show astrocytes as crucial players of tau seeding in tauopathies. Altered mitochondrial function is characteristic in the substantia nigra in Parkinson's disease (PD). Information about mitochondria in other brain regions such as the cerebral cortex is conflicting mainly because most studies have not contemplated the possibility of variable involvement depending on the region, stage of disease progression and clinical symptoms such as the presence or absence of dementia. RT-qPCR of 18 nuclear mRNAs encoding subunits of mitochondrial complexes and 12 mRNAs encoding energy metabolism-related enzymes; western blotting of mitochondrial proteins; and analysis of enzymatic activities of complexes I, II, II, IV and V of the respiratory chain were assessed in frontal cortex area 8 and the angular gyrus of middle-aged individuals (MA), and those with incidental PD (iPD), long-lasting PD with parkinsonism without dementia (PD) and long-lasting PD with dementia (PDD). Up-regulation of several genes was found in frontal cortex area 8 in PD when compared with MA and in the angular gyrus in iPD when compared with MA. Marked down-regulation of genes encoding mitochondrial subunits and energy metabolism-related enzymes occurs in frontal cortex but only of genes coding for energy metabolism-related enzymes in the angular gyrus in PDD. Significant decrease in the protein expression levels of several mitochondrial subunits encoded by these genes occurs in frontal cortex area 8 and angular gyrus in PDD. Moreover, expression of MT-ND1 which is encoded by mitochondrial DNA is also reduced in PDD. Reduced enzymatic activity of complex III in frontal cortex area 8 and angular gyrus is observed in PD, but dramatic reduction in the activity of complexes I, II, II and IV in both regions characterizes PDD. Dementia in the context of PD is linked to region-specific deregulation of genomic genes encoding subunits of mitochondrial complexes and to marked reduction in the activity of mitochondrial complexes I, II, III and IV. The development and maturation of cortical circuits relies on the coordinated actions of long and short range axonal guidance cues. In this regard, the class 3 semaphorins and their receptors have been seen to be involved in the development and maturation of the hippocampal connections. However, although the role of most of their family members have been described, very few data about the participation of Semaphorin 3E (Sema3E) and its receptor PlexinD1 during the development and maturation of the entorhino-hippocampal (EH) connection are available. In the present study, we focused on determining their roles both during development and in adulthood. We determined a relevant role for Sema3E/PlexinD1 in the layer-specific development of the EH connection. Indeed, mice lacking Sema3E/PlexinD1 signalling showed aberrant layering of entorhinal axons in the hippocampus during embryonic and perinatal stages. In addition, absence of Sema3E/PlexinD1 signalling results in further changes in postnatal and adult hippocampal formation, such as numerous misrouted ectopic mossy fibers. More relevantly, we describe how subgranular cells express PlexinD1 and how the absence of Sema3E induces a dysregulation of the proliferation of dentate gyrus progenitors leading to the presence of ectopic cells in the molecular layer. Lastly, Sema3E mutant mice displayed increased network excitability both in the dentate gyrus and the hippocampus proper. N-methyl-D-aspartate receptors (NMDARs) respond to glutamate to allow the influx of calcium ions and the signaling to the mitogen-activated protein kinase (MAPK) cascade. Both MAPK- and Ca2+-mediated events are important for both neurotransmission and neural cell function and fate. Using a heterologous expression system, we demonstrate that NMDAR may interact with the EF-hand calcium-binding proteins calmodulin, calneuron-1, and NCS1 but not with caldendrin. NMDARs were present in primary cultures of both neurons and microglia from cortex and hippocampus. Calmodulin in microglia, and calmodulin and NCS1 in neurons, are necessary for NMDA-induced MAP kinase pathway activation. Remarkably, signaling to the MAP kinase pathway was blunted in primary cultures of cortical and hippocampal neurons and microglia from wild-type animals by proteins involved in neurodegenerative diseases: α-synuclein, Tau, and p-Tau. A similar blockade by pathogenic proteins was found using samples from the APPSw,Ind transgenic Alzheimer’s disease model. Interestingly, a very marked increase in NMDAR–NCS1 complexes was identified in neurons and a marked increase of both NMDAR–NCS1 and NMDAR–CaM complexes was identified in microglia from the transgenic mice. The results show that α-synuclein, Tau, and p-Tau disrupt the signaling of NMDAR to the MAPK pathway and that calcium sensors are important for NMDAR function both in neurons and microglia. Finally, it should be noted that the expression of receptor–calcium sensor complexes, specially those involving NCS1, is altered in neural cells from APPSw,Ind mouse embryos/pups. The expression of subunits of mitochondrial respiratory complexes and components of the protein synthesis machinery from the nucleolus to the ribosome was analyzed in the mediodorsal thalamus in seven cases of Fatal Familial Insomnia (FFI) compared with age-matched controls. NDUFB8 (complex I subunit), SDHB (complex II subunit), UQCRC2 (complex III subunit), COX2 (complex IV subunit) and ATP50 (complex V subunit) expression levels, as revealed by western blotting, were reduced in FFI. Voltage-dependent anion channel (VDAC) and ATP5H were also reduced due to the marked depopulation of neurons. In contrast, a marked increase in superoxide dismutase 2 (SOD2) was found in reactive astrocytes thus suggesting that astrocytes are key factors in oxidative stress responses. The histone-binding chaperones nucleolin and nucleoplasmin 3, and histone H3 di-methylated K9 were markedly reduced together with a decrease in the expression of protein transcription elongation factor eEF1A. These findings show severe impairment in the expression of crucial components of mitochondrial function and protein synthesis in parallel with neuron loss in mediodorsal thalamus at terminal stages of FFI. Therapeutic measures must be taken long before the appearance of clinical symptoms to prevent the devastating effects of FFI. Semaphorin 7A (sema7A) is classified as an immune semaphorin with dual functions in the immune system and in the central nervous system (CNS). These molecules are of interest due to their potential role in multiple sclerosis (MS), which is a chronic demyelinating and neurodegenerative disease of autoimmune origin. In this study, we elucidated the role of sema7A in neuroinflammation using both in vitro and in vivo experimental models. In an in vitro model of neuroinflammation, using cerebellar organotypic slice cultures, we observed that challenge with lipopolysaccharide (LPS) endotoxin did not affect demyelination or cell death in sema7A-deficient cultures compared to wild-type cultures. Moreover, the in vivo outcome of experimental autoimmune encephalomyelitis (EAE) in sema7A-deficient mice was altered in an antigen- and adjuvant-dose-dependent manner, while no differences were observed in the wild-type counterparts. Altogether, these results indicate that sema7A is involved in peripheral immunity and CNS inflammation in MS pathogenesis. Indeed, these data suggest that sema7A might be a potential therapeutic target to treat MS and autoimmune conditions. In the mammalian telencephalon, part of the progenitor cells transition from multipolar to bipolar morphology as they invade the mantle zone. This associates with changing patterns of radial migration. However, the molecules implicated in these morphology transitions are not well known. In the present work, we analyzed the function of FoxP2 protein in this process during telencephalic development in vertebrates. We analyzed the expression of FoxP2 protein and its relation with cell morphology and migratory patterns in mouse and chicken developing striatum. We observed FoxP2 protein expressed in a gradient from the subventricular zone to the mantle layer in mice embryos. In the FoxP2 low domain cells showed multipolar migration. In the striatal mantle layer where FoxP2 protein expression is higher, cells showed locomoting migration and bipolar morphology. In contrast, FoxP2 showed a high and homogenous expression pattern in chicken striatum, thus bipolar morphology predominated. Elevation of FoxP2 in the striatal subventricular zone by in utero electroporation promoted bipolar morphology and impaired multipolar radial migration. In mouse cerebral cortex we obtained similar results. FoxP2 promotes transition from multipolar to bipolar morphology by means of gradiental expression in mouse striatum and cortex. Together these results indicate a role of FoxP2 differential expression in cell morphology control of the vertebrate telencephalon. Neuron loss, synaptic decline, and spongiform change are the hallmarks of sporadic Creutzfeldtâ€“Jakob disease (sCJD), and may be related to deficiencies in mitochondria, energy metabolism, and protein synthesis. To investigate these relationships, we determined the expression levels of genes encoding subunits of the 5 protein complexes of the electron transport chain, proteins involved in energy metabolism, nucleolar and ribosomal proteins, and enzymes of purine metabolism in frontal cortex samples from 15 cases of sCJD MM1 and age-matched controls. We also assessed the protein expression levels of subunits of the respiratory chain, initiation and elongation translation factors of protein synthesis, and localization of selected mitochondrial components. We identified marked, generalized alterations of mRNA and protein expression of most subunits of all 5 mitochondrial respiratory chain complexes in sCJD cases. Expression of molecules involved in protein synthesis and purine metabolism were also altered in sCJD. These findings point to altered mRNA and protein expression of components of mitochondria, protein synthesis machinery, and purine metabolism as components of the pathogenesis of CJD. Keywords: Creutzfeldt–Jakob disease, Electron transport chain, Mitochondria, Oxidative phosphorylation, Protein synthesis, Purine. Prolonged and sustained stimulation of the hypothalamo-pituitary-adrenal axis have adverse effects on numerous brain regions, including the cerebellum. Motor coordination and motor learning are essential for animal and require the regulation of cerebellar neurons. The G-protein-coupled cannabinoid CB1 receptor coordinates synaptic transmission throughout the CNS and is of highest abundance in the cerebellum. Accordingly, the aim of this study was to investigate the long-lasting effects of chronic psychosocial stress on motor coordination and motor learning, CB1 receptor expression, endogenous cannabinoid ligands and gene expression in the cerebellum. After chronic psychosocial stress, motor coordination and motor learning were impaired as indicated the righting reflex and the rota-rod. The amount of the endocannabinoid 2-AG increased while CB1 mRNA and protein expression were downregulated after chronic stress. Transcriptome analysis revealed 319 genes differentially expressed by chronic psychosocial stress in the cerebellum; mainly involved in synaptic transmission, transmission of nerve impulse, and cell-cell signaling. Calreticulin was validated as a stress candidate gene. The present study provides evidence that chronic stress activates calreticulin and might be one of the pathological mechanisms underlying the motor coordination and motor learning dysfunctions seen in social defeat mice. Keywords: Psychosocial stress, Cerebellum, Calreticulin, Endocannabinoid system, Behavior, RNA seq. Fatal familial insomnia (FFI) is an autosomal dominant prion disease caused by a D178N mutation in PRNP in combination with methionine at codon 129 in the mutated allele of the same gene. The present study analyzes pathological and molecular features in 7 FFI cases carrying the mutation D178N and M homozygous at the codon 129 of PRNP. Severe neuronal loss and marked astrocytic gliosis was observed in every case in the mediodorsal and anterior nuclei of the thalamus whereas the entorhinal cortex (EC) was variably affected. Spongiform degeneration was only observed in the EC. Synaptic and fine granular PrPSc immunoreactivity was found in the EC but not in thalamus. Microglia was barely increased in the mediodorsal thalamus, but mRNA expression of IL6, IL10RA, CSF3R and TLR7 was found in the thalamus in FFI. PrPC levels were significantly decreased in the thalamus, EC and cerebellum in FFI compared with controls. However, increased expression of the non-glycosylated band of about 19 kDa was observed in the thalamus when using PrP antibodies mapping to the central region of the PrP comprising the α-helix domains H1 and H2. Decreased PrP mRNA levels were also observed in the thalamus and EC. Altered PrP solubility was observed in FFI compared with controls; significantly reduced PrP levels in the cytoplasmic fraction and increased insoluble levels were found in FFI cases when compared with controls. Amyloid-like deposits were only seen in the EC. RT-QuIC assay which mimics in vitro the conversion of PrPc to misfolded and amyloid PrP revealed that all the FFI samples of the entorhinal cortex were positive whereas the thalamus was positive only in 3 cases; the cerebellum was positive in 2 cases. All controls were negative. The expression of subunits of mitochondrial respiratory complexes and components of the protein synthesis machinery from the nucleolus to the ribosome was analyzed in the mediodorsal thalamus. NDUFB8 (complex I subunit), SDHB (complex II subunit), UQCRC2 (complex III subunit), COX2 (complex IV subunit) and ATP50 (complex V subunit) expression levels were reduced in FFI. Voltage-dependent anion channel and ATP5H were also reduced. In contrast, a marked increase in superoxide dismutase 2 was found in reactive astrocytes. The histone-binding chaperones nucleolin and nucleoplasmin 3, and histone H3 di-methylated K9 were markedly reduced together with a decrease in the expression of protein transcription elongation factor eEF1A in mediodorsal thalamus. The cellular prion protein (PrPC) has been associated with a plethora of cellular functions ranging from cell cycle to neuroprotection. Mice lacking PrPC show an increased susceptibility to epileptic seizures; the protein, then, is neuroprotective. However, lack of experimental reproducibility has led to considering the possibility that other factors besides PrPC deletion, such as the genetic background of mice or the presence of so-called “Prnp flanking genes”, might contribute to the reported susceptibility. Here, we performed a comparative analysis of seizure-susceptibility using characterized Prnp+/+ and Prnp0/0 mice of B6129, B6.129, 129/Ola or FVB/N genetic backgrounds. Our study indicates that PrPC plays a role in neuroprotection in KA-treated cells and mice. For this function, PrPC should contain the aa32–93 region and needs to be linked to the membrane. In addition, some unidentified “Prnp-flanking genes” play a role parallel to PrPC in the KA-mediated responses in B6129 and B6.129 Prnp0/0 mice. The FOXA family of transcription factors regulates chromatin structure and gene expression especially during embryonic development. In normal breast tissue FOXA1 acts throughout mammary development; whereas in breast carcinoma its expression promotes luminal phenotype and correlates with good prognosis. However, the role of FOXA2 has not been previously studied in breast cancer. Our purpose was to analyze the expression of FOXA2 in breast cancer cells, to explore its role in breast cancer stem cells, and to correlate its mRNA expression with clinicopathological features and outcome in a series of patients diagnosed with breast carcinoma. We analyzed FOXA2 mRNA expression in a retrospective cohort of 230 breast cancer patients and in cell lines. We also knocked down FOXA2 mRNA expression by siRNA to determine the impact on cell proliferation and mammospheres formation using a cancer stem cells culture assay. In vitro studies demonstrated higher FOXA2 mRNA expression in Triple-Negative/Basal-like cells. Further, when it was knocked down, cells decreased proliferation and its capability of forming mammospheres. Similarly, FOXA2 mRNA expression was detected in 10 % (23/230) of the tumors, especially in Triple-Negative/Basal-like phenotype (p < 0.001, Fisher's test). Patients whose tumors expressed FOXA2 had increased relapses (59 vs. 79 %, p = 0.024, log-rank test) that revealed an independent prognostic value (HR = 3.29, C.I.95 % = 1.45-7.45, p = 0.004, Cox regression). Our results suggest that FOXA2 promotes cell proliferation, maintains cancer stem cells, favors the development of Triple-Negative/Basal-like tumors, and is associated with increase relapses. Vulnerability for psychosis is determined by the interacting contributions of multiple genetic and environmental factors. Dysregulation of corticostriatal circuitry has long been thought to be critical in the etiology of psychotic disorders. Psychosocial stress is known to have a great influence on brain function and behavior. In response to persistent stress exposure, chronic glucocorticoid exposure appears to have adverse effects on numerous brain regions. Glucocorticoid receptor (GR) functioning is regulated in part by FKBP5 and its activity modulates serotoninergic neurotransmission. Extracellular serotonin reuptake is monitored by the serotonin transporter gene SLC6A4. Cannabinoid CB1 receptor mediates glucocorticoid effects and it’s highly expressed in the corticostriatal circuits. The cellular prion protein (PrPC) plays a key role in prion diseases when it converts to the pathogenic form scrapie prion protein. Increasing knowledge of its participation in prion infection contrasts with the elusive and controversial data regarding its physiological role probably related to its pleiotropy, cell-specific functions, and cellular-specific milieu. Multiple approaches have been made to the increasing understanding of the molecular mechanisms and cellular functions modulated by PrPC at the transcriptomic and proteomic levels. Gene expression analyses have been made in several mouse and cellular models with regulated expression of PrPC resulting in PrPC ablation or PrPC overexpression. These analyses support previous functional data and have yielded clues about new potential functions. However, experiments on animal models have shown moderate and varied results which are difficult to interpret. Moreover, studies in cell cultures correlate little with in vivo counterparts. Yet, both animal and cell models have provided some insights on how to proceed in the future by using more refined methods and selected functional experiments. Gaining a basic understanding of the inhibitory molecules and the intracellular signaling involved in axon development and repulsion after neural lesions is of clear biomedical interest. In recent years, numerous studies have described new molecules and intracellular mechanisms that impair axonal outgrowth after injury. In this scenario, the role of glycogen synthase kinase 3 beta (GSK3Î²) in the axonal responses that occur after central nervous system (CNS) lesions began to be elucidated. GSK3Î² function in the nervous tissue is associated with neural development, neuron polarization, and, more recently, neurodegeneration. In fact, GSK3Î² has been considered as a putative therapeutic target for promoting functional recovery in injured or degenerative CNS. In this review, we summarize current understanding of the role of GSK3Î² during neuronal development and regeneration. In particular, we discuss GSK3Î² activity levels and their possible impact on cytoskeleton dynamics during both processes. Healthy bi-directional intracellular transport along the axons between the somatodendritic and synaptic terminals is crucial to maintain the function and viability of neurons. When misbalanced, there is neuronal homeostasis failure that compromises its function and viability. In fact, several neurodegenerative diseases originate from misbalanced axonal transport and function. Thus numerous techniques have been developed to establish and maintain neuronal cultures in compartmented microfluidic devices to better understand these processes mimicking neuronal polarization. Although useful, these in vitro platforms do not allow for a full specific and temporal analysis in a completely monitored way. In this study, we have utilized a microfluidic system with large open cell culture reservoirs to precisely control neuronal microenvironments, capable of mimicking axon transport and synapse formation and to facilitate their analysis. We demonstrate using this lab-on-a-chip system for long-term motoneuron co-culture with C2C12-derived myotubes to mimic neuro-muscular junction (NMJ) formation. Furthermore, by integration with a calcium (Ca2+) imaging technique, we have proved the NMJ functionality in-chip through KCl-induced Ca2+ transient in connected myotubes. This platform can potentially become a useful tool as a straightforward, reproducible, and high-throughput in vitro model for basic NMJ research, and for high-throughput drug screening. Santiago Ramón y Cajal developed a great body of scientific research during the last decade of 19th century, mainly between 1888 and 1892, when he published more than 30 manuscripts. The neuronal theory, the structure of dendrites and spines, and fine microscopic descriptions of numerous neural circuits are among these studies. In addition, numerous cell types (neuronal and glial) were described by RamÃ³n y Cajal during this time using this "reazione nera" or Golgi method. Among these neurons were the special cells of the molecular layer of the neocortex. These cells were also termed Cajal cells or Retzius cells by other colleagues. Today these cells are known as Cajal-Retzius cells. From the earliest description, several biological aspects of these fascinating cells have been analyzed (e.g., cell morphology, physiological properties, origin and cellular fate, putative function during cortical development, etc). In this review we will summarize in a temporal basis the emerging knowledge concerning this cell population with specific attention the pioneer studies of Santiago Ramón y Cajal. Neurotrophins are involved in many crucial cellular functions, including neurite outgrowth, synapse formation, and plasticity. Although these events have long been known, the molecular determinants underlying neuritogenesis have not been fully characterized. Ack1 (activated Cdc42-associated tyrosine kinase) is a non-receptor tyrosine kinase that is highly expressed in the brain. Here, we demonstrate that Ack1 is a molecular constituent of neurotrophin signaling cascades in neurons and PC12 cells. We report that Ack1 interacts with Trk receptors and becomes tyrosine phosphorylated and its kinase activity is increased in response to neurotrophins. Moreover, our data indicate that Ack1 acts upstream of the Akt and MAPK pathways. We show that Ack1 overexpression induces neuritic outgrowth and promotes branching in neurotrophin-treated neuronal cells, whereas the expression of Ack1 dominant negatives or short-hairpin RNAs counteract neurotrophin-stimulated differentiation. Our results identify Ack1 as a novel regulator of neurotrophin-mediated events in primary neurons and in PC12 cells. During cerebellum development, Sonic hedgehog (Shh)-induced proliferation of cerebellar granular neuronal precursors (CGNPs) is potently inhibited by bone morphogenetic proteins (BMPs). We have previously reported the upregulation of TIEG-1 and Mash1, two antimitotic factors that modulate MYCN transcription and N-Myc activity, in response to BMP2. To gain further insight into the BMP antimitotic mechanism, we used microRNA (miRNA) arrays to compare the miRNAs of CGNPs proliferating in response to Shh with those of CGNPs treated with Shh plus BMP2. The array analysis revealed that miRNA 11 (miR-22) levels significantly increased in cells treated with BMP2. Additionally, in P7 mouse cerebellum, miR-22 distribution mostly recapitulated the combination of BMP2 and BMP4 expression patterns. Accordingly, in CGNP cultures, miR-22 overexpression significantly reduced cell proliferation, whereas miR-22 suppression diminished BMP2 antiproliferative activity. In contrast to BMP2, miR-22 did not induce neural differentiation but instead significantly increased cell cycle length. Consistent with the central role played by N-myc on CGNP proliferation, Max was revealed as a direct target of miR-22, and miR-22 expression caused a significant reduction of Max protein levels and N-myc/Max-dependent promoter activity. Therefore, we conclude that, in addition to the previously described mechanisms, miR-22 plays a specific role on downstream BMPs through cerebellum growth. BACKGROUND:MicroRNAs (miRNAs) are short non-coding regulatory RNAs that control gene expression usually producing translational repression and gene silencing. High-throughput sequencing technologies have revealed heterogeneity at length and sequence level for the majority of mature miRNAs (IsomiRs). Most isomiRs can be explained by variability in either Dicer1 or Drosha cleavage during miRNA biogenesis at 5' or 3' of the miRNA (trimming variants). Although isomiRs have been described in different tissues and organisms, their functional validation as modulators of gene expression remains elusive. Here we have characterized the expression and function of a highly abundant miR-101 5'-trimming variant (5'-isomiR-101).RESULTS:The analysis of small RNA sequencing data in several human tissues and cell lines indicates that 5'-isomiR-101 is ubiquitously detected and a highly abundant, especially in the brain. 5'-isomiR-101 was found in Ago-2 immunocomplexes and complementary approaches showed that 5'-isomiR-101 interacted with different members of the silencing (RISC) complex. In addition, 5'-isomiR-101 decreased the expression of five validated miR-101 targets, suggesting that it is a functional variant. Both the binding to RISC members and the degree of silencing were less efficient for 5'-isomiR-101 compared with miR-101. For some targets, both miR-101 and 5'-isomiR-101 significantly decreased protein expression with no changes in the respective mRNA levels. Although a high number of overlapping predicted targets suggest similar targeted biological pathways, a correlation analysis of the expression profiles of miR-101 variants and predicted mRNA targets in human brains at different ages, suggest specific functions for miR-101- and 5'-isomiR-101.CONCLUSIONS:These results suggest that isomiRs are functional variants and further indicate that for a given miRNA, the different isomiRs may contribute to the overall effect as quantitative and qualitative fine-tuners of gene expression. Background: Epidermal Growth Factor (EGF) plays an important function in the regulation of cell growth, proliferation, and differentiation by binding to its receptor (EGFR) and providing cancer cells with increased survival responsiveness. Signal transduction carried out by EGF has been extensively studied at both transcriptional and post-transcriptional levels. Little is known about the involvement of microRNAs (miRNAs) in the EGF signaling pathway. miRNAs have emerged as major players in the complex networks of gene regulation, and cancer miRNA expression studies have evidenced a direct involvement of miRNAs in cancer progression.Results: In this study, we have used an integrative high content analysis approach to identify the specific miRNAs implicated in EGF signaling in HeLa cells as potential mediators of cancer mediated functions. We have used microarray and deep-sequencing technologies in order to obtain a global view of the EGF miRNA transcriptome with a robust experimental cross-validation. By applying a procedure based on Rankprod tests, we have delimited a solid set of EGF-regulated miRNAs. After validating regulated miRNAs by reverse transcription quantitative PCR, we have derived protein networks and biological functions from the predicted targets of the regulated miRNAs to gain insight into the potential role of miRNAs in EGF-treated cells. In addition, we have analyzed sequence heterogeneity due to editing relative to the reference sequence (isomiRs) among regulated miRNAs.Conclusions: We propose that the use of global genomic miRNA cross-validation derived from high throughput technologies can be used to generate more reliable datasets inferring more robust networks of co-regulated predicted miRNA target genes. The physiological functions of PrPC remain enigmatic, but the central domain, comprising highly conserved regions of the protein may play an important role. Indeed, a large number of studies indicate that synthetic peptides containing residues 106-126 (CR) located in the central domain (CD, 95-133) of PrPC are neurotoxic. The central domain comprises two chemically distinct subdomains, the charge cluster (CC, 95-110) and a hydrophobic region (HR, 112-133). The aim of the present study was to establish the individual cytotoxicity of CC, HR and CD. Our results show that only the CD peptide is neurotoxic. Biochemical, Transmission Electron Microscopy and Atomic Force Microscopy experiments demonstrated that the CD peptide is able to activate caspase-3 and disrupt the cell membrane, leading to cell death. As olfactory receptor axons grow from the peripheral to the central nervous system (CNS) aided by olfactory ensheathing cells (OECs), the transplantation of OECs has been suggested as a plausible therapy for spinal cord lesions. The problem with this hypothesis is that OECs do not represent a single homogeneous entity, but, instead, a functionally heterogeneous population that exhibits a variety of responses, including adhesion and repulsion during cell-matrix interactions. Some studies report that the migratory properties of OECs are compromised by inhibitory molecules and potentiated by chemical gradients. In this paper, we report a system based on modified OECs carrying magnetic nanoparticles as a proof of concept experiment enabling specific studies aimed at exploring the potential of OECs in the treatment of spinal cord injuries. Our studies have confirmed that magnetized OECs (i) survive well without exhibiting stress-associated cellular responses; (ii) in vitro, their migration can be modulated by magnetic fields; and (iii) their transplantation in organotypic slices of spinal cord and peripheral nerve showed positive integration in the model. Altogether, these findings indicate the therapeutic potential of magnetized OECs for CNS injuries. Creutzfeldt-Jakob disease (cJD) is a heterogenic neurodegenerative disorder associated with abnormal posttranslational processing of cellular prion protein (PrPc). cJD displays distinctive clinical and pathological features which correlate with the genotype at the codon 129 (methionine or valine: M or V respectively) in the prion protein gene and with size of the protease-resistant core of the abnormal prion protein PrPsc (type 1:20/21 kDa and type 2:19 kDa). MM1 and VV2 are the most common sporadic cJD (scJD) subtypes. PrP mRNa expression levels in the frontal cortex and cerebellum are reduced in scJD in a form subtype-dependent. Total PrP protein levels and PrPsc levels in the frontal cortex and cerebellum accumulate differentially in scJD MM1 and scJD VV2 with no relation between PrPsc deposition and spongiform degeneration and neuron loss, but with microgliosis, and IL6 and TNF-Î± response. In the cSF, reduced PrPc, the only form present in this compartment, occurs in scJD MM1 and VV2. PrP mRNa expression is also reduced in the frontal cortex in advanced stages of alzheimer disease, Lewy body disease, progressive supranuclear palsy, and frontotemporal lobe degeneration, but PrPc levels in brain varies from one disease to another. Reduced PrPc levels in cSF correlate with PrP mRNa expression in brain, which in turn reflects severity of degeneration in scJD. This protocol uses rat tail-derived type I collagen hydrogels to analyze key processes in developmental neurobiology, such as chemorepulsion and chemoattraction. 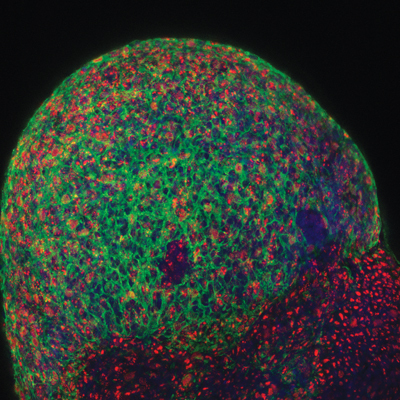 The method is based on culturing small pieces of brain tissue from embryonic or early perinatal mice inside a 3D hydrogel formed by rat tail-derived type I collagen or, alternatively, by commercial Matrigel. The neural tissue is placed in the hydrogel with other brain tissue pieces or cell aggregates genetically modified to secrete a particular molecule that can generate a gradient inside the hydrogel. The present method is uncomplicated and generally reproducible, and only a few specific details need to be considered during its preparation. Moreover, the degree and behavior of axonal growth or neural migration can be observed directly using phase-contrast, fluorescence microscopy or immunocytochemical methods. This protocol can be carried out in 4 weeks. Semaphorins are secreted or membrane-anchored proteins that play critical roles in neural development and adult brain plasticity. Sema4F is a transmembrane semaphorin found on glutamatergic synapses, in which it is attached to the PSD-95-scaffolding protein. Here we further examined the expression of Sema4F by raising specific antibodies. We show that Sema4F protein is widely expressed by neurons during neural development and in the adult brain. We also demonstrate a preferential localization of this protein in postsynaptic dendrites. Moreover, Sema4F is expressed not only by neurons but also by oligodendrocyte precursors in the optic nerve and along the migratory pathways of oligodendroglial cells, and also by subsets of postnatal oligodendroglial cells in the brain. Finally, in vitro experiments demonstrate that endogenous Sema4F expressed by brain cells of oligodendroglial lineage regulates the outgrowth migration of oligodendrocyte precursors and promotes their differentiation. The present data extend our knowledge about the expression of Sema4F and uncover a novel function in the control of oligodendrocyte precursor migration in the developing brain. There are numerous studies describing the signaling mechanisms that mediate oligodendrocyte precursor cell (OPC) proliferation and differentiation, although the contribution of the cellular prion protein (PrPc) to this process remains unclear. PrPc is a glycosyl-phosphatidylinositol (GPI)-anchored glycoprotein involved in diverse cellular processes during the development and maturation of the mammalian central nervous system (CNS). Here we describe how PrPc influences oligodendrocyte proliferation in the developing and adult CNS. OPCs that lack PrPc proliferate more vigorously at the expense of a delay in differentiation, which correlates with changes in the expression of oligodendrocyte lineage markers. In addition, numerous NG2-positive cells were observed in cortical regions of adult PrPc knockout mice, although no significant changes in myelination can be seen, probably due to the death of surplus cells. We present a method for using long-term organotypic slice co-cultures of the entorhino-hippocampal formation to analyze the axon-regenerative properties of a determined compound. The culture method is based on the membrane interphase method, which is easy to perform and is generally reproducible. The degree of axonal regeneration after treatment in lesioned cultures can be seen directly using green fluorescent protein (GFP) transgenic mice or by axon tracing and histological methods. Possible changes in cell morphology after pharmacological treatment can be determined easily by focal in vitro electroporation. The well-preserved cytoarchitectonics in the co-culture facilitate the analysis of identified cells or regenerating axons. The protocol takes up to a month. Huntington disease (HD) is a neurodegenerative disorder that predominantly affects neurons of the forebrain. We have applied the Illumina massively parallel sequencing to deeply analyze the small RNA populations of two different forebrain areas, the frontal cortex (FC) and the striatum (ST) of healthy individuals and individuals with HD. More than 80% of the small-RNAs were annotated as microRNAs (miRNAs) in all samples. Deep sequencing revealed length and sequence heterogeneity (IsomiRs) for the vast majority of miRNAs. Around 80–90% of the miRNAs presented modifications in the 3′-terminus mainly in the form of trimming and/or as nucleotide addition variants, while the 5′-terminus of the miRNAs was specially protected from changes. Expression profiling showed strong miRNA and isomiR expression deregulation in HD, most being common to both FC and ST. The analysis of the upstream regulatory regions in co-regulated miRNAs suggests a role for RE1-Silencing Transcription Factor (REST) and P53 in miRNAs downregulation in HD. The putative targets of deregulated miRNAs and seed-region IsomiRs strongly suggest that their altered expression contributes to the aberrant gene expression in HD. Our results show that miRNA variability is a ubiquitous phenomenon in the adult human brain, which may influence gene expression in physiological and pathological conditions. The oligodendrocyte myelin glycoprotein is a glycosylphosphatidylinositol-anchored protein expressed by neurons and oligodendrocytes in the central nervous system. Attempts have been made to identify the functions of the myelin-associated inhibitory proteins (MAIPs) after axonal lesion or in neurodegeneration. However, the developmental roles of some of these proteins and their receptors remain elusive. Recent studies indicate that NgR1 and the recently discovered receptor PirB restrict cortical synaptic plasticity. However, the putative factors that trigger these effects are unknown. Because Nogo-A is mostly associated with the endoplasmic reticulum and myelin associated glycoprotein appears late during development, the putative participation of OMgp should be considered. Here, we examine the pattern of development of OMgp immunoreactive elements during mouse telencephalic development. OMgp immunoreactivity in the developing cortex follows the establishment of the thalamo-cortical barrel field. At the cellular level, we located OMgp neuronal membranes in dendrites and axons as well as in brain synaptosome fractions and axon varicosities. Lastly, the analysis of the barrel field in OMgp-deficient mice revealed that although thalamo-cortical connections were formed, their targeting in layer IV was altered, and numerous axons ectopically invaded layers II-III. Our data support the idea that early expressed MAIPs play an active role during development and point to OMgp participating in thalamo-cortical connections. We have studied the motor abilities and associative learning capabilities of adult mice placed in different enriched environments. Three-month-old animals were maintained for a month alone (AL), alone in a physically enriched environment (PHY), and, finally, in groups in the absence (SO) or presence (SOPHY) of an enriched environment. The animals' capabilities were subsequently checked in the rotarod test, and for classical and instrumental learning. The PHY and SOPHY groups presented better performances in the rotarod test and in the acquisition of the instrumental learning task. In contrast, no significant differences between groups were observed for classical eyeblink conditioning. The four groups presented similar increases in the strength of field EPSPs (fEPSPs) evoked at the hippocampal CA3-CA1 synapse across classical conditioning sessions, with no significant differences between groups. These trained animals were pulse-injected with bromodeoxyuridine (BrdU) to determine hippocampal neurogenesis. No significant differences were found in the number of NeuN/BrdU double-labeled neurons. We repeated the same BrdU study in one-month-old mice raised for an additional month in the above-mentioned four different environments. These animals were not submitted to rotarod or conditioned tests. Non-trained PHY and SOPHY groups presented more neurogenesis than the other two groups. Thus, neurogenesis seems to be related to physical enrichment at early ages, but not to learning acquisition in adult mice. P>Lesioned axons do not regenerate in the adult mammalian CNS, owing to the over-expression of inhibitory molecules such as myelin-derived proteins or chondroitin sulphate proteoglycans. In order to overcome axon inhibition, strategies based on extrinsic and intrinsic treatments have been developed. For myelin-associated inhibition, blockage with NEP1-40, receptor bodies or IN-1 antibodies has been used. In addition, endogenous blockage of cell signalling mechanisms induced by myelin-associated proteins is a potential tool for overcoming axon inhibitory signals. We examined the participation of glycogen synthase kinase 3 beta (GSK3 beta) and extracellular-related kinase (ERK) 1/2 in axon regeneration failure in lesioned cortical neurons. We also investigated whether pharmacological blockage of GSK3 beta and ERK1/2 activities facilitates regeneration after myelin-directed inhibition in two models: (i) cerebellar granule cells and (ii) lesioned entorhino-hippocampal pathway in slice cultures, and whether the regenerative effects are mediated by Nogo Receptor 1 (NgR1). We demonstrate that, in contrast to ERK1/2 inhibition, the pharmacological treatment of GSK3 beta inhibition strongly facilitated regrowth of cerebellar granule neurons over myelin independently of NgR1. Finally, these regenerative effects were corroborated in the lesioned entorhino-hippocampal pathway in NgR1-/- mutant mice. These results provide new findings for the development of new assays and strategies to enhance axon regeneration in injured cortical connections. A study on the preparation of N-alkylglycines (peptoids) that contain tertiary amino residues on the N-alkyl side chains is reported. The appropriate combination of the submonomer strategy with N-alkylglycine monomer couplings depending upon the structure of the N-alkyl side chain that must be incorporated into the peptoid is determinant for the efficiency of the synthetic pathway. The application of this strategy to the preparation of SICHI, an N-alkyglycine trimer containing tertiary amino residues in the three N-alkyl branches, and that has been identified as a potent Semaphorin 3A inhibitor, is presented.